Happy New Year! I’m actually writing this post on December 31st. Come Sunday morning I expect to be lying in bed nursing a small hangover after our traditional New Years Eve barbeque. It’s the only night of the year I manage to stay up late any more. 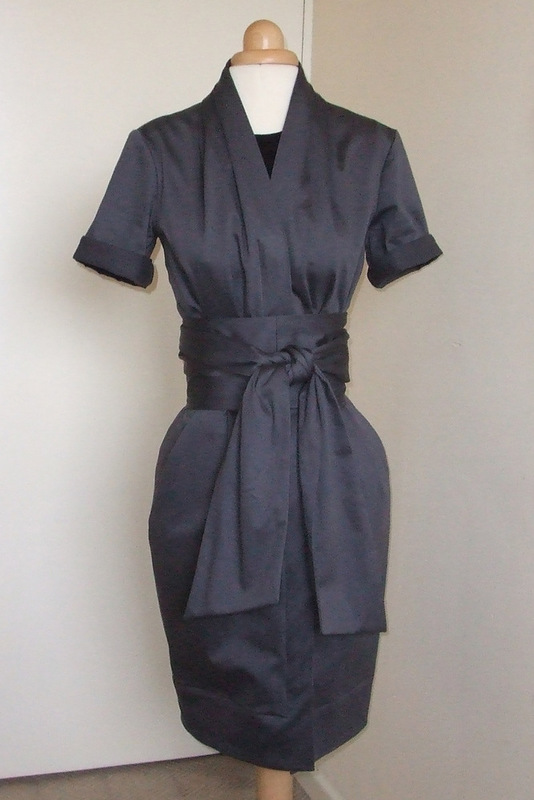 The dress above is my last make of 2011, Vogue 1220 in grey cotton sateen. I made it once already in navy blue sateen and it came out scandalously short. Despite the lack of length I have worn it a lot, always combined with very thick tights. The blue version also needs a slip because the sateen sticks to tights and wrinkles at the slightest excuse. The grey version has another two inches of length added to the bodice over my usual two, making four in all, which brings it to about the right length. It is lined in black cupro. Lining was pretty easy because the dress is finished with facings all the way round. I cut out the main pattern pieces in the lining fabric (leaving off the foldback self-facing on the front pieces) and made them up in the same way as the dress but without the front pleats to give a bit of ease. Then I pinned the lining inside the dress shell and and finished the facings over the top of it. I had to invisibly hem the lining to the dress around the neck to make it stay put there. I didn’t line the sleeves. I basted the lining to the dress at the armsyce and finished the armsyce with the overlocker after setting in the sleeves. The buttons nearly caused this dress not to get finished at all. I marked the button placement incorrectly and didn’t notice until I’d sewn five of them on. Sewing on buttons is absolutely my least favourite sewing activity. But here they are, all attached in the right places at last. This is my pattern of the year, narrowly beating Vogue 1239. It’s comfortable, flattering, and it has pockets. I’ve liked every version I’ve seen made up and there are a lot of them out there. Come on Vogue, give us another one like this in 2012! It started out as half a metre of black wool jersey I’ve been keeping in my stash for nearly a year. Most of the piece became a long-sleeved t-shirt but as usual it turned out I’d bought too much yardage. 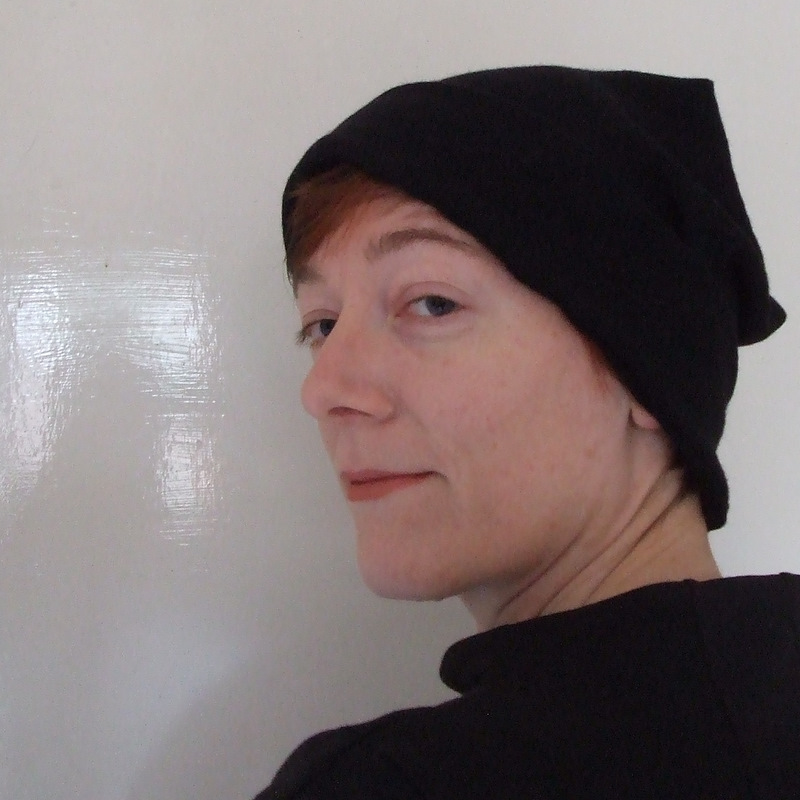 I always intended to make a hat out of the leftovers, but didn’t get any further at the time than finding a suitable hat tutorial on the Internet. By the time I finally made the hat I’d lost the link to the tutorial. 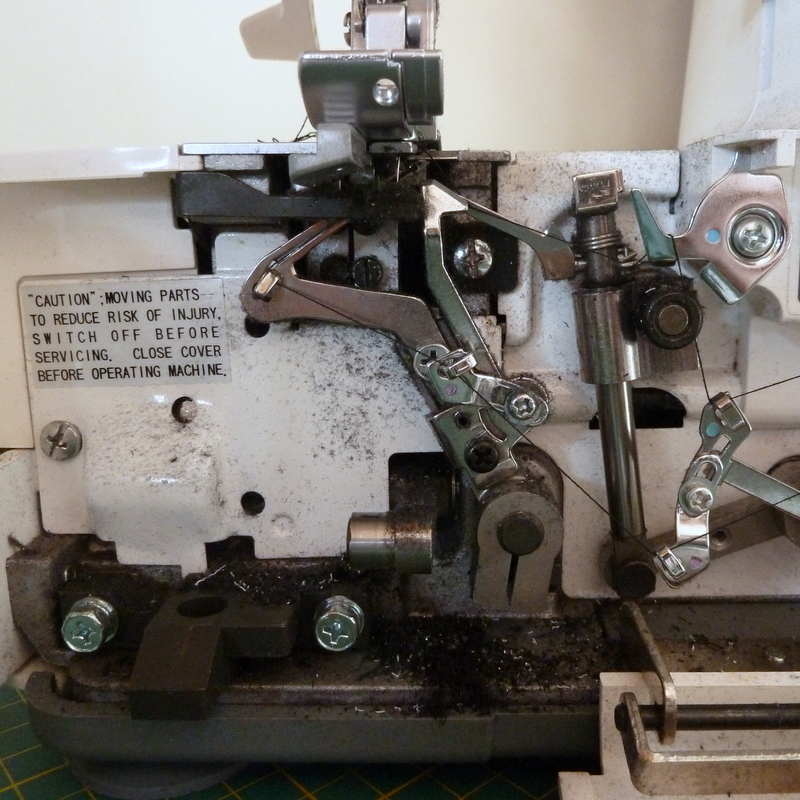 However I acquired an overlocker this year, a device which I find induces a spirit of complete recklessness in sewing. It’s something to do with its whirling blades of doom. I made the hat according to what I could remember of the tutorial. I sewed the jersey into a tube of about the right circumference to fit round my head and then sewed a straight seam along the top. The next step I find almost impossible to describe or draw. I wish I could find that tutorial and link to it! You flatten out the fabric along the top seam, letting the sides fold underneath, so you have a right-angle at each end of the top seam. 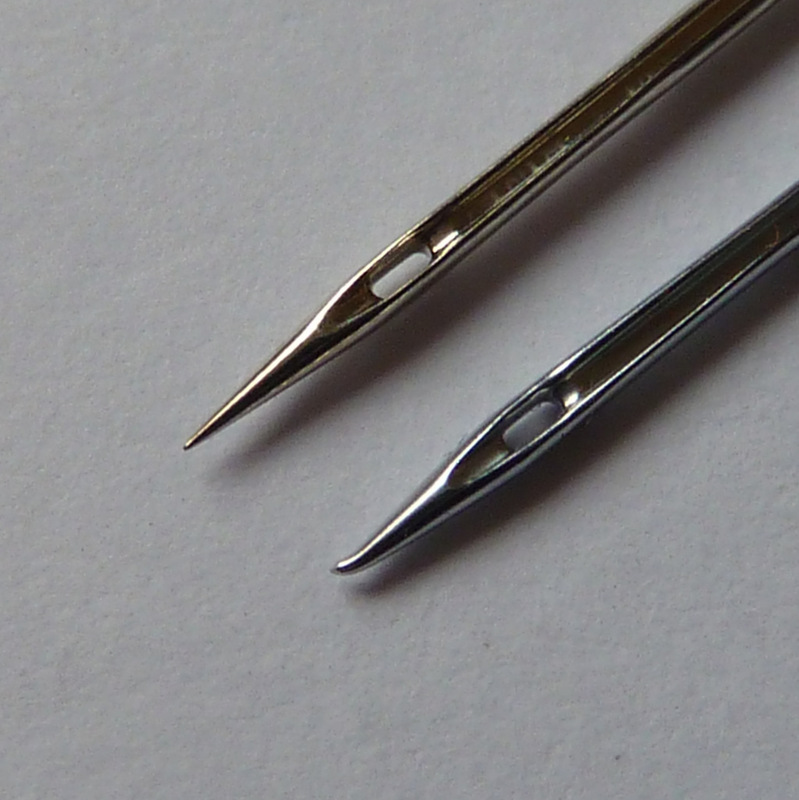 Then you sew two seams at right angles to the original seam, cutting off the corners. I’m not sure what was supposed to come after that, but I chopped off the other end of the tube, folded it in two, and overlocked it back onto the cut edge to make a ear-warming band. The top has little pointy bits where the ends of the seams are, which I quite like. From this angle it doesn’t so much resemble a flowerpot as an attempt at medieval costume. I am certainly going to wear it. And if anyone knows the tutorial I have lost, do let me know so I can link back to it. 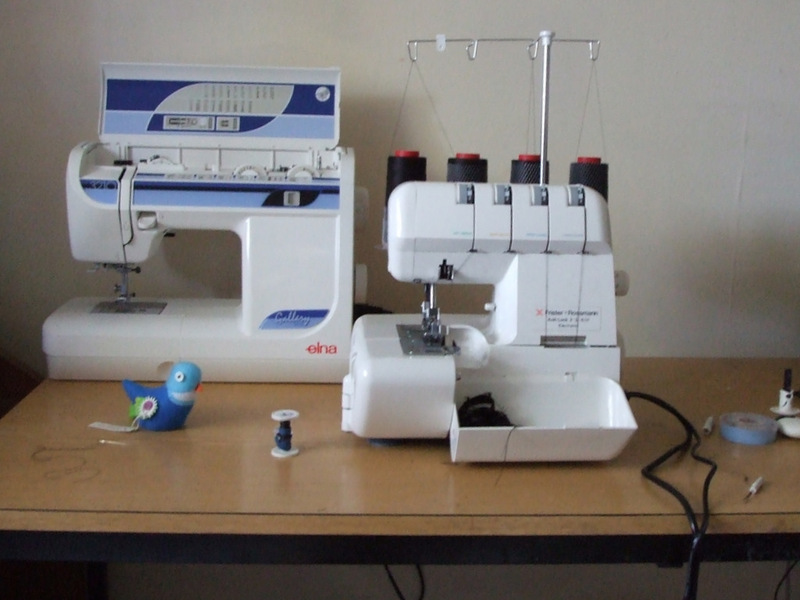 Recently I bought an overlocker. 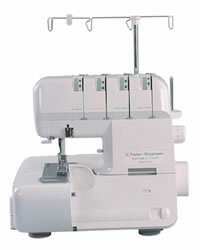 I’ve been assured that once you get one, you’ll wonder how you ever sewed without it. I duly tried out all the stitches on mine and then decided I’d wait for the right project to come up before I used it for real: one where the fabric was something I wouldn’t mind destroying if it all went horribly wrong. Well the best laid plans, etc etc. My sewing machine flatly refused to sew the viscose doubleknit fabric I am using for the current project. 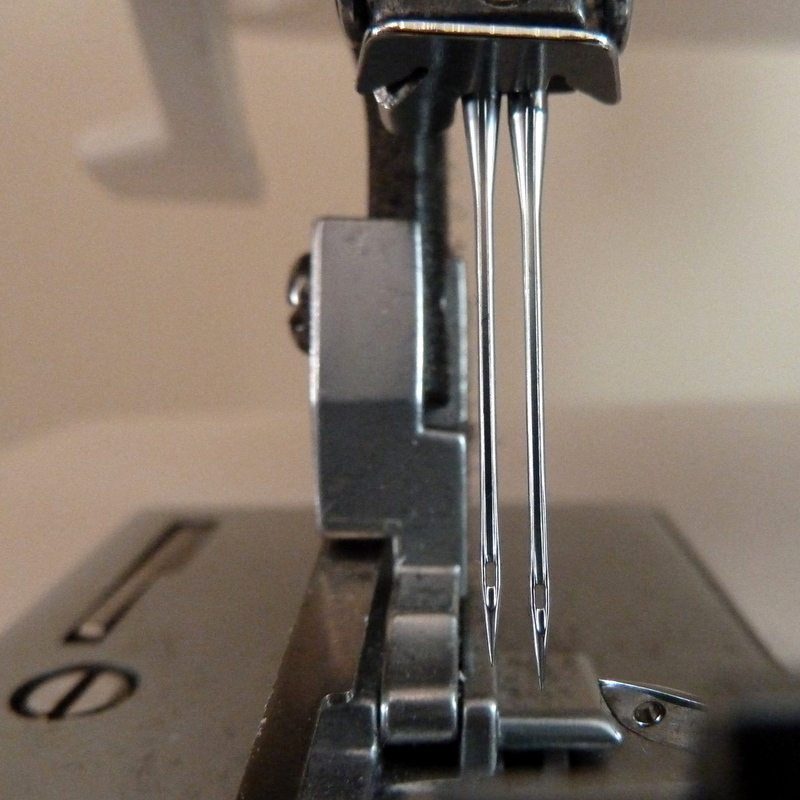 So I nervously threaded the overlocker and fed a fairly straight seam into it. And then a curved one. And then I sewed the sleeves in. It’s brilliant. It sews through just about anything and it’s seriously fast. But there’s one thing about it that surprised me. Regular sewing makes quite a bit of mess – at least I’m always surprised by the state of the floor round the sewing table. 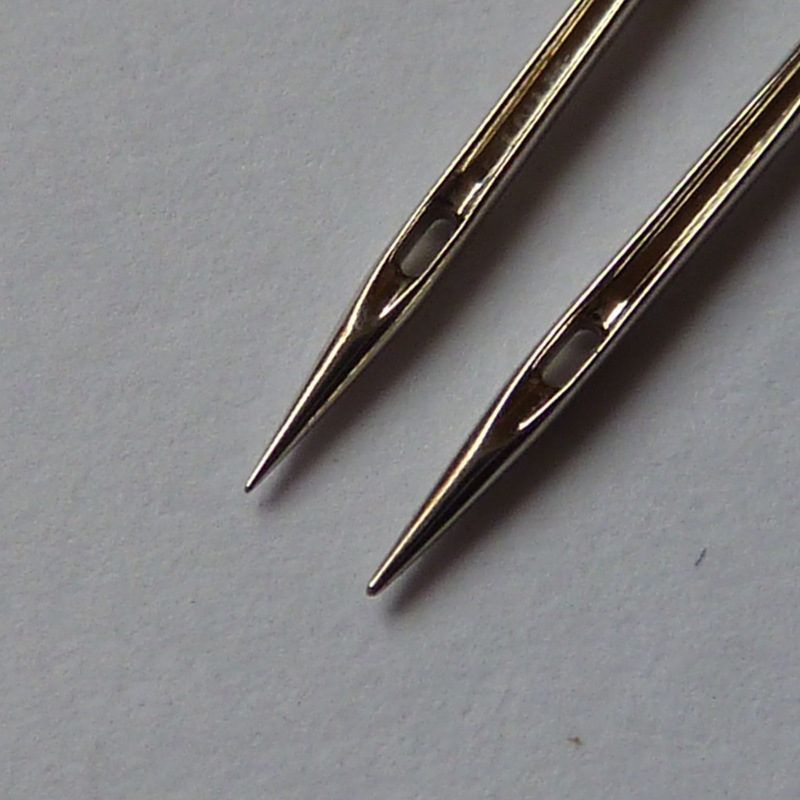 But the overlocker spreads its fuzz even further than the sewing machine. Specifically, all over your face. I don’t notice it until I take my make up off, but the cotton wool comes out grey! Does this happen to anyone else? 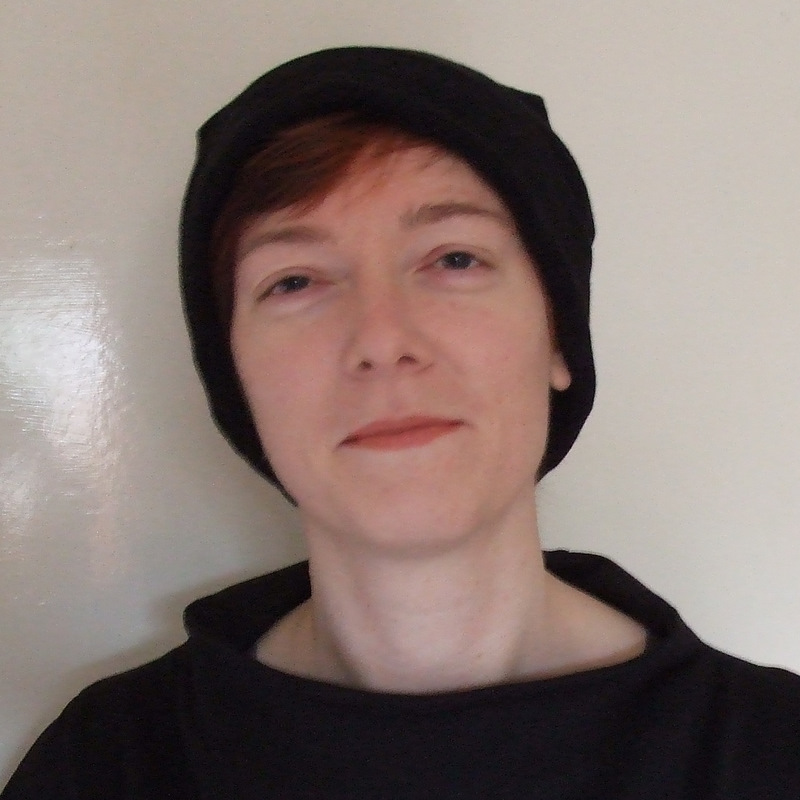 Much food for thought about my fitting problems with Vogue 8633 – thanks everyone! The black version is underway and looking hopeful so far. And it’s distracting me from the fact that my new overlocker has not arrived. Unfortunately it was not in stock. It was supposed to come in on Wednesday but hasn’t, so fingers crossed for next week. 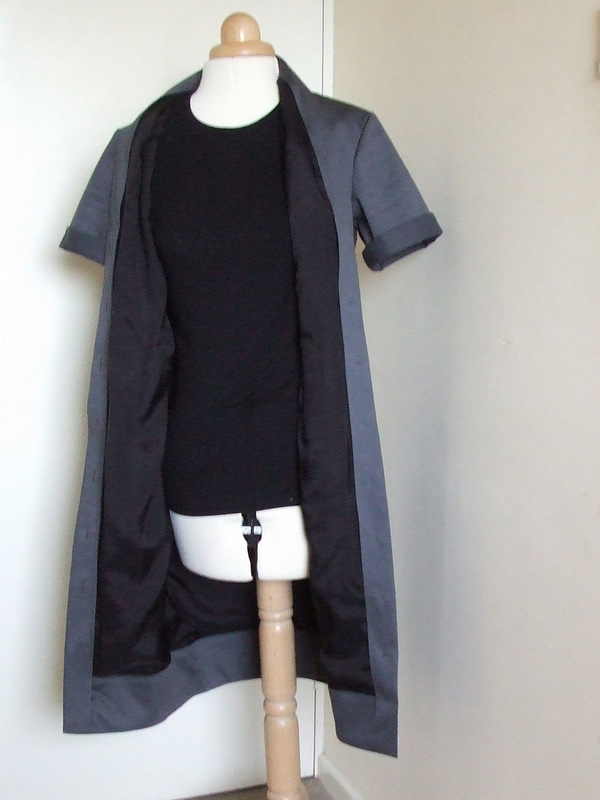 Not that I have anything planned to sew with it yet…but I really want to have a go at threading it.